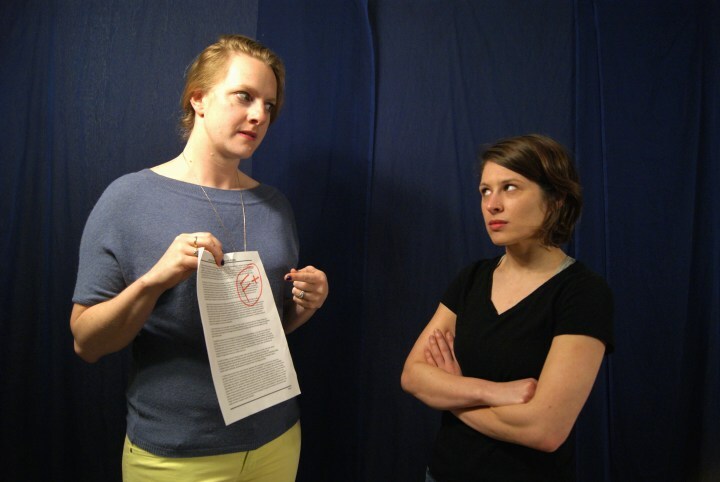 Directors Robyn Ginsburg Braverman and Troy Johnson join forces with actors Ariel Aronica, Tess Middlebrook, Brianna Mitchell, Bryan Moriarty, Kyle Smith, Michael Weiland, and Alison Whismore to present these plays pared down to only eight out of the myriad submissions. As always, the stories cover a lot of ground across multiple themes running from somber to whimsical with several stops in between. In addition to direction, Johnson also provided the scenic design while Braverman provided the sound design for the evening including many well-known song recordings that aptly set the mood and tone for each play. The sets are abstract, but when combined with an accompanying thematic projection, there is no doubt as to the location of the action. As each play is set up, a thematic song is played, and its title is first projected upstage center letting the audience know which one is about to begin. The evening starts with For Art’s Sake. This scene begins well-grounded in a comfortable reality, rather academically in a museum. Whismore plays Mona, an aging art history professor, talking with her technologically oriented son (Weiland) about her lot in life, and her concerns about his. After an animated, somewhat humorous discussion analyzing an antique painting from both the artistic and analytic perspectives held by Mona and Art respectively, Mona leaves, and Art remains. From there, the scene shifts into a more fanciful tone with Mitchell assuming a rather prominent role. The story, and its ensuing banter is engaging throughout, and all three actors interact with intensity and care. Stella Wind explores an interesting dynamic between a concerned mother (Middlebrook) and her unusual daughter (Aronica). Which is more important, getting good grades in school, or setting aside that dreary schoolwork for a more important pursuit for a while? This one offers an amusing alternative, pitting mother and daughter against one another via a battle of witty repartee to sort out their priorities. The humor works, and the story, while potentially benefitting from further fleshing out, rolls to a satisfying conclusion. Mirror to Face attempts a little more than really can fit in this extended scene as Smith, Mitchell, and Moriarty face off in a play about the stage in a period piece harkening back to the dreams and hopes of a Yiddish theatre performer in 1903. This short story explores the allure of Broadway versus film, the confluence of prejudice, and the demands and constraints of familial pride and expectations. The concept is interesting, but the script could benefit from a more in-depth exploration. The emotion, particularly from Smith’s character, seems a little forced in this context. Anasazi Breakdown is another period piece set in 1946. Middlebrook’s and Smith’s characters are at odds in a tense encounter in the desert, where modernity and mysticism collide one eerie night. Eventually, Whismore and Weiland enter the scene, shifting the dynamic slightly, but the tension holds throughout. This one feels much like a ghost story one might hear while sitting around a remote summer campfire. Deuce Cooper: The Bloomfield Case features Whismore, Smith, Weiland, Mitchell, and Moriarty in a delightful noir piece set in the 1940s. The rapid-fire, well-timed dialog invokes almost every detective cliché imaginable, and once the action starts rolling, it races to the finish line at breakneck speed with loyalties shifting beyond recognition. Every detail works, right down to Weiland’s portrayal of Donny No-Sleeves in name-appropriate costuming. Whismore is wonderful as Donna (the requisite girl Friday) as she reads Deuce’s (Smith) phone messages to him in character voices when he enters his office. The ensuing chaos is hilarious, easily making this scene the most delicious slice in the 2017 collection. Aboriginal is a serious piece based on true stories about adoption told by an international panel of people (played by Moriarty, Aronica, Middlebrook, and Weiland) affected by adoption either directly, or by proxy via a close relative. The subject matter is important, raising deep questions about why each child was given up, whether they should search for their birth parents, how their lives could be different, etc., but the script doesn’t quite work in its current form. The writing is fragmented, abruptly jumping from person to person, each sharing their family story. The actors tell the stories with great emotion and characterization, but there is too much missing. This is really a much longer story that could benefit from further development. Meantime in Between Time is another, mostly somber piece where sisters (Middlebrook and Whismore) come together to sort through their deceased brother’s belongings. There are a few lighter moments, but there is also conflict here as we find that their dearly departed brother, Benny (Smith), was troubled in life. The writing is a little compact, but the story is poignant. Both Middlebrook and Whismore punch the emotion of the situation with conviction making the character journey in this short piece compelling. 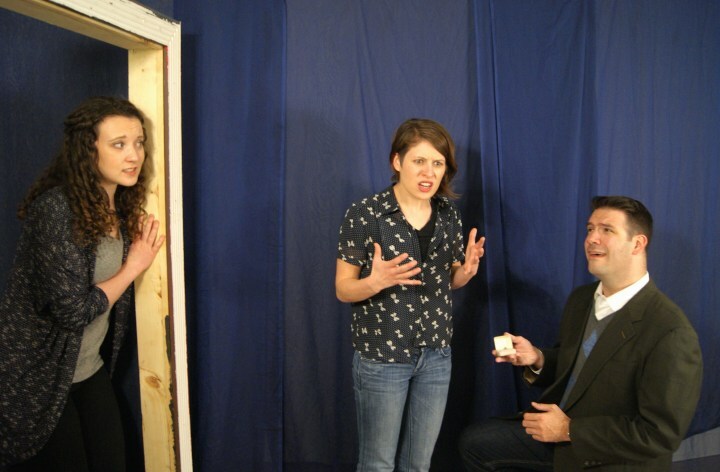 Proposal is a lighthearted piece that takes an enlightening look at feminism as it pertains to societal norms surrounding that all-important decision about whether to marry or not. Although written with comic flair, the question in a marriage proposal is valid, and despite convention, does it really matter who asks it in the end? The piece features Mitchell, Aronica, and Moriarty, all capturing both the comedy and thoughtfulness of the piece very nicely. Pear Slices is always an event to be savored. This showcase is an enjoyable, early look at budding new works, and it provides an eclectic mix of theatre that collectively appeals to a wide audience. Many of the plays go on to various festivals, while others serve as the germ of a future, larger work. No matter their fate, these plays deserve to be seen during this run.